Great offers for many special courses! Fast and Easy Nitrox (Enriched Air) specialty according to PADI!!! Special price only 150 € per person including book Enriched Air and certification fees. Try the unique feeling of diving without the noisy bubbles! Warm gas, amazing feeling and an experience that you will remember for ever! One day program that includes theory, unit preparations and diving with a CCR. This amazing experience only with 150 Euro! for more infos regarding the program please call at +30 210 8041485. The program Certified Gas Blender της ANDI is the most complete course for gas blending. It is the only one that teach you about the Oxygen handling and blending for making all nitrox mixes, but also Helium blending for deep diving. Great price only 250 € that includes manual, certification fees and the Gas Blending Program GAP. 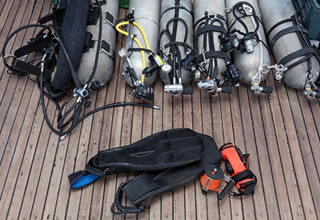 You can easily combine the Nitrox (PADI Enriched Air Diver) with Gas Blending with just additional cost of 120,00 €. Equipment Technician and Oxygen Service! That is not a simple course. It gives you all the information how to maintain your equipment as well as how to use it with high oxygen mixtures! Learn how to repair small problems and how to check your equipment and keep it in the best condition. Special price that includes manual, certification and all practical applications, 300 €. You can combine it with Gas Blender adding just 200 € and of course with the PADI Enriched Air Diver with another 120,00 €. Do you have an Apeks Regulator? Do you want to service it yourself? Do you want to know how exactly your regulator works? Learn to maintain, repair, service and adjust your Apeks Regulator. Get your Apeks Service Technician Certification and at the same time the right to purchase original Apeks spare parts. This demanding program is for skilled technicians. Two days of theory and practice cost only 300 Euro including all service manuals and certification. It does not include any tools.